Geeking for Good, not Evil. I keep meaning to post an update on my May goals list and I keep getting lost in Diablo 3. Not sure how I end up there instead of here, but it keeps happing. Tonight my husband is supposed to be playing with my brother and friends, so I figured I'd get some time to post about my completed May Goals. So far, he's not playing with anyone though, so not sure how long I'll be here, so I better get down to business! May's goals were to finish my desk, which you saw in a previous post. I love it. I am now going to paint a small wood bookcase the same color and put it in my crafting area. I am also going to line the drawers with fabric since I cant find any contact paper I like. I found a nice tutorial at Infarrantly Creative. I have the fabric I want to use already in my stash and I made an emergency run to Joann's today to get the fabric Modge Podge. Maybe I should put the bookcase and the drawers in my June Goals instead of the other stuff I put up. Hmmm. My next finish is the cover for my husband's chair. He's a big Star Trek and Big Bang Theory fan. So in the BBT episode where they have a Gorn sitting in Sheldon's seat, my husband went crazy. I knew I had to somehow stitch this up for him. I found a cute little cross stitch Gorn designed by Black-Lupin on Deviant Art. It says "No, Gorn, No! That's where I sit." which is the quote from BBT. I think it came out pretty cute and the husband loves it. I dont have any pictures of my progress on Growth Rings. It wasnt too much anyway. I've not been stitching anyway. Another reason for no pictures is that my camera cant decide if it wants to work or not. Today, it doesnt. Thankfully it did when I was taking pictures of the other items. My last May goal was to do something small. I didnt have anything in mind when I posted that goal. I just like to have it in there, just in case. I really love this last one though. I think it was a stroke of genius! Well, crafting genius! Ok, probably not genius, but clever? Anyway, my cousin loves to do origami. He makes these cute little dragons that are about the size of a quarter. I have 2 of them and they've been stashed in a plastic toothpick container since I know my cats would just love to eat a couple of little dragons. They didnt seem happy in the container...the dragons, not the cats. So I decided to repurpose my husband's dice box he had. I knew that the dragon needed a hoard, cause that's what dragons do. So I made him a hoard of gold, silver and gems...or as they are known in the crafting world, seed beads and bugle beads. I also added a little sword bead I had laying around. He's quite happy now. I just need to make his sister a hoard as well so she'll be happy too. I think I'll make her's a little girlyer though. And here's a pic with a quarter next to him so you'll get an idea of his size. STNA Blog Hop #3 Setting goals. Do you set stitching goals for yourself and how do you plan them out? (Weekly, monthly, annually?) What are your current stitching goals (if you don’t mind sharing)? In addition to setting goals for yourself, do you have a special reward that you reserve for when you reach a stitching goal? I go on and off with the goal setting for my crafting. On one hand, I like the freedom to do whatever I feel like doing with my hobby....no time restraints, no must do items, do pressure at all. It is a hobby after all. On the other hand, I like the feeling of finishing something in a timely manner. I like to remind myself of the great idea I want to do. Goals help me with that. Left to my own devices I'd have 101 WIPs laying around the house. I wouldn't have a single finish anywhere. I'd have magazine clippings and internet bookmarks of all sorts of cool stuff I intended to do, but never got around to doing. For the last few months I have been setting up realistic goals for myself. That seems to be the key to goal setting. I have done this before where I'd set unrealistic goals (ie: start and complete a full sized HAED design). Yeah, that just doesn't happen. Then I'd get bummed out that my goals weren't reached and that I was a loser in the crafting world! Oh woe is me! *dramatic hand on forehead* Lately I have been better about planning out my goals. Doing an item that needs to be done (finishing up something that is 30 minutes from being done, or covering my ironing board), something small, but fun, and making progress on an ongoing larger project. I'll toss in another item here and there depending on birthdays, holidays, etc. I think the goal for goal setting for a hobby is to be kind to yourself. Don't overburden yourself with goals and make sure they are items that can and will be done. I managed to finish May's goals. I'll post pictures in a day or two. I am still waiting for the glue to dry on one of them. I am still considering June's goals. I think my brain has a case of the "Summers". It's kind of like a case of the "Mondays", but last for 3 months. Ha! Put an extra layer of padding on my ironing board. One small project of my choice. Maker Faire fun, now with Annular Eclipse Action Figure! 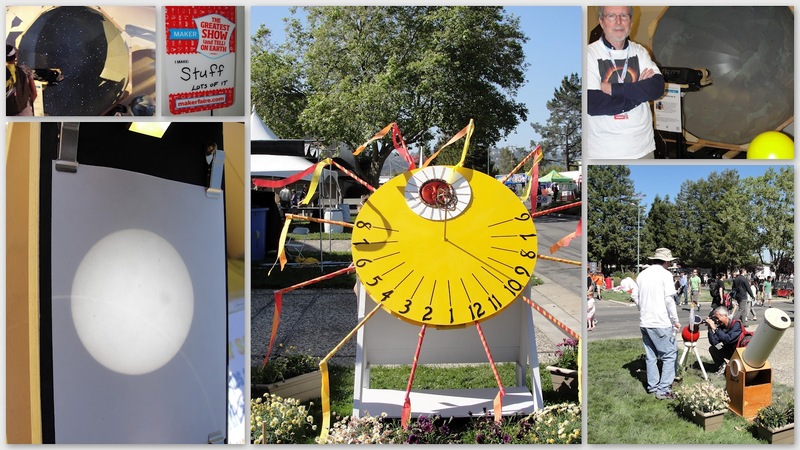 I can not say enough good things about the Maker Faire. This year I was able to see both sides of the event. First, I got to walk around being a guest and seeing all the fair has to offer. Second, I was an exhibitor and got to interact with all the other guests. And the whole weekend ended on a high note by watching the Annular Eclipse with 100+ people. As a guest I got to see ArcAttack, get my picture taken with a real live talking and walking (floating? rolling?) Dalek, get tested to see if I was a zombie and many other things. Fortunately, I passed my test and I am still human. The gentleman before me must have been bit somewhere, because he tested zombie! :O There were exhibits of all kinds of techs, crafts and just plain old fun stuff. 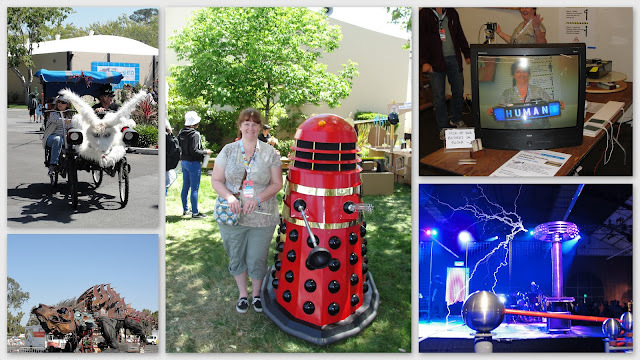 Maker Faire is really hard to describe to someone who's never been. It's crafts. It's tech. It's art. It's a mix of all three. There's even a little steampunk thrown in for fun. The main thing about Maker Faire is that everything is made by normal and not so normal people. It can be as simple as a cardboard robot, or as complicated as hand made working replicas of R2D2. There are giant fire breathing dragons made from bits and pieces of garbage. Real live blacksmiths show off their skills. There was a fire truck that blew fire up into the air. A viking ship made out of cardboard and bicycles that someone rode around on. Everything is very hands on. There are many booths set up so you can make your own blinking LED necklace, Freak Flag, learn to solder, grow your own food, all sorts of things. I could go on forever! But I wont. As an exhibitor I got to meet hundreds and hundreds of people that were excited to see the sun from my stepfather's telescopes and talk about sun spots and the eclipse. Before the fair I thought it'd be a "job", boring, a pain in my arse, etc. Turns out it was really fun. I loved the whole thing! I never thought to take pictures of the huge crowd we had around the outside exhibit where I spent all of my time. You can see the giant sundial my step-dad made. He also made the white telescope on the bottom right, as well as the planetarium in the two upper corners! No, he's not an astronomer by trade. It's just a hobby of his. I also added in a projection of the sun. We had three very clear sunspots showing all weekend. I only had one person be a bummer. She couldn't figure out why we'd even want to look at the sun. *rolls eyes* Everyone else was very excited and I couldn't believe the amount of children that knew more than me! Not that I am an expert on the sun, but I studied all week! As for the eclipse, it was pretty amazing. I spent a lot of the eclipse urging people to share the telescopes and the eclipse viewers we had. I tried to make sure everyone got a chance to see what was going on. I did manage to take a few peaks myself. I was standing next to the Sun Spotter, so I took a lot of pictures of the sun on that. 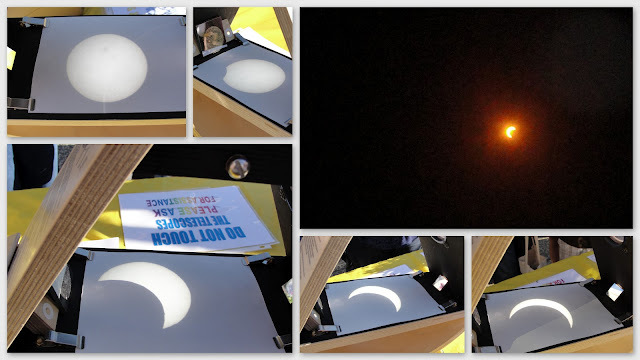 I was amazed at how everyone was so good at passing the viewers around and how everyone was excited to see the eclipse even though we only got to about 84% coverage here where I live. Time to start planning for the next solar eclipse in North America! We have a few years...2017. I found this desk. It was sitting next to the dumpster at my apartment complex. It had been gouged and poorly spray painted black. (I had already started sanding it before I decided to take the before picture.) The reason I grabbed it was because it was a solid wood desk. Not press-board. Not veneer. Not ply-wood. Real wood. Even the inside of the drawers are real wood. I couldn't let it be tossed in the garbage. 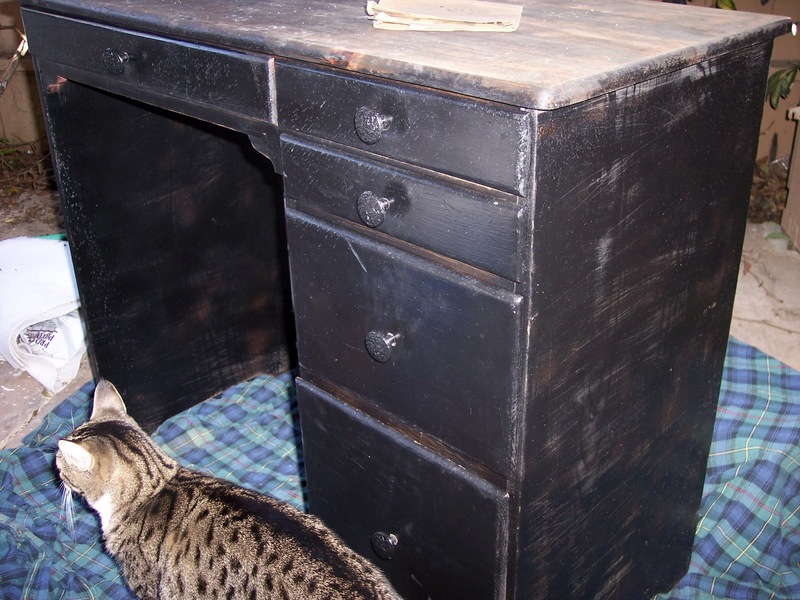 Now, I have never refinished any furniture before, but, hey! the desk was small. How hard could it be?? The hardest part was actually overcoming my fear of refinishing something. I read a lot of online tutorials that explained how important it was to use the right sand paper, the right stripper, the right everything. I gave up on being perfect and just had fun with it in the end. In the end it took me 3 years to complete. First and second years I sanded and striped it. The second year I did some more sanding and primed and painted everything but the drawers. This last year, the poor drawers have been sitting on the patio waiting for primer and paint. I finally finished them up this week! I am pretty excited. Fresh coat of paint and new knobs. You may have noticed that the long top drawer is missing. The bottom of the drawer was broke in 2 pieces and I wasnt sure that wood glue would fix it well enough, so I decided to just leave it out. Instead I put in a piece of plywood and left it open. The idea was to have a place to store my laptop when not in use. We'll see how that ends up. My laptop is near it's death. I am sure I'll find something to stuff in there though! An action shot with Sewandsew. I have asked my son's girlfriend if she wouldn't mind doing some artwork on the drawers. She does really cute water colors of flowers and swirlies and vines and stuff. I am hoping she'll do something to fancy it up a bit. So here we go, one goal for May complete! I am half done with the cover for my husband chair. I haven't even touched Growth Rings. :( And my gimme goal of something small, might just have to be the fact that I survived work over Mother's Day week and the Maker Faire this weekend. Although, I shouldn't count my eggs before their hatched. I haven't survived the Maker Faire yet! Do you use a stand when you stitch? If so, tell us about it and share pictures if you’ve got them. If not, would you like to try using a stand? Do you have any tips or tricks around using a stand versus not using a stand? I do not use a stand and I never have. I know most people have a favorite chair where they sit to stitch, but I dont stitch in a chair. Because our apartment is so small and my daughter keeps moving in and out, we dont have much furniture in the living room. My husband and I have gotten into the habit of using our bedroom as the living area. So, I only stitch while in bed. I have a breakfast tray that I set my scissors, floss, etc on. I have a metal board and easel that hold my chart, and a clip on magnifying lamp. I have also picked up the habit of stitching in hand, so there are no scroll rods, q-snaps, hoops, etc to put on any kind of stand. My cats were always crawling onto my q-snaps and stretching my fabric and getting hair all over the project. This way it's just in a little pile that I can stuff into my project bag quick and easy. I keep my ort jar on my bedside table so it's easy to drop them in as I stitch. It has also become a catch-all for my necklaces and notes from my daughter. Close up of my stitching set up...ignore the cat print on the lamp. Maybe someday when we get a bigger place or less children coming back home all the time I'll get a nice big, comfy chair with a floor stand. For now, this is what fits my lifestyle. holder on the bedside table. Cant wait to visit everyone else's blogs! Leave a comment when you drop by! Have you ever had a case of the “stitching blahs” where you just didn’t want to stitch? Or maybe it was more like you didn’t get to stitch because you were busy and that created a chain reaction sense of the “blahs” and led to even less stitching…. sort of like a case of “the Mondays” that we are all familiar with. How do you handle your stitching blahs and get back into stitching mode? I have definitely had the 'stitching blahs'. Not nearly as often as I get the 'doing the dishes blahs'! When I have the blahs for an evening or two, I just go with the flow and do something else. I don't let it stress me out or think that I "need" to be stitching. Stitching is meant to be fun and relaxing. It's not supposed to be work or stressful. Sometimes I have a long "blahs" streak, days, weeks or even months. This usually happens when I am working on something really large or an obligation piece that has a time limit. There are 2 things that I do to break out of my blahs. One is to finish up something small or something else that is close to being finished. Nothing gets my stitching mojo back than a good old fashioned finish. Something I can admire and show off. You get that feeling of accomplishment and the world seems right again. For this purpose I keep a lot of smalls around ready to pick up and finish in a night or two. I love small beading projects for this. I also have a project bag full of almost finished projects. Things that just need to be framed, turned into a pillow or whatever, or even things that just need a hanging string put on them. The second thing that brings back the mojo is a new start or some stitching shopping. And by shopping I don't just mean buying stuff. There are plenty of wonderful free designs out there, and plenty of fabric and threads I forgot I had hiding in my crafting closet! New blood refreshes the senses. It brings back the excitement of stitching. Watching something new unfold before you, new colors, new textures, new designs. To keep from getting the blahs now days, I always make sure I work on 2-3 big projects (no more or you get overwhelmed) and swap them out often. I try to make them completely different types of designs, colors, fabrics, and threads. I like to mix it up a little. I also set small goals for myself. I celebrate each small finish, even if it's just a part of a larger design. I also make sure to toss in a small or two into the rotation so I have some quick finishes. Since I have started doing that my blahs only last a day or two. And that's not really considered "the blahs" is it?? And here we go for the final lineup for the April Goals. In my last post you saw a few of the goals already posted. I made some progress on Growth Rings by Ink Circles. It's looking pretty good. I have a goal for it in mind for next month already. I am using a hand dyed linen from a grab bag from Hand Dyed Fibers, and the floss is Summer & Smoke (the inside color) and Arctic Ice (the outside color) by Gloriana. I am a huge Ink Circles junkie. I already have Cirque des Cercles framed above my desk where I can see it every day. Cirque des Carreaux is hanging in the closet waiting for me to save up $400 to get it framed properly to match CdC. I need to frame up Here Comes Treble for my daughter as a house warming gift since she's leaving for her own apartment on the 1st. Here's Erica Michael's Serenity Prayer Petite...cept'in I didnt make it petite. I made it BIG! I stitched it with the recommended DMC and stitched it on some old 18ct Fiddler's cloth I had laying around. I wanted to be able to see it and read it every day. I don't say a lot of prayers, but this one just makes sense. It also has special meaning for my husband since he's on his 4th year being sober. This prayer is a big part of his program. This summer is gonna be big for him; 4 years sober and graduating with his BS in Information Technologies! Yay husband! Here's my start of my first embroidery I have done since I was about 10 years old. Below is the original picture that I am using as inspiration. 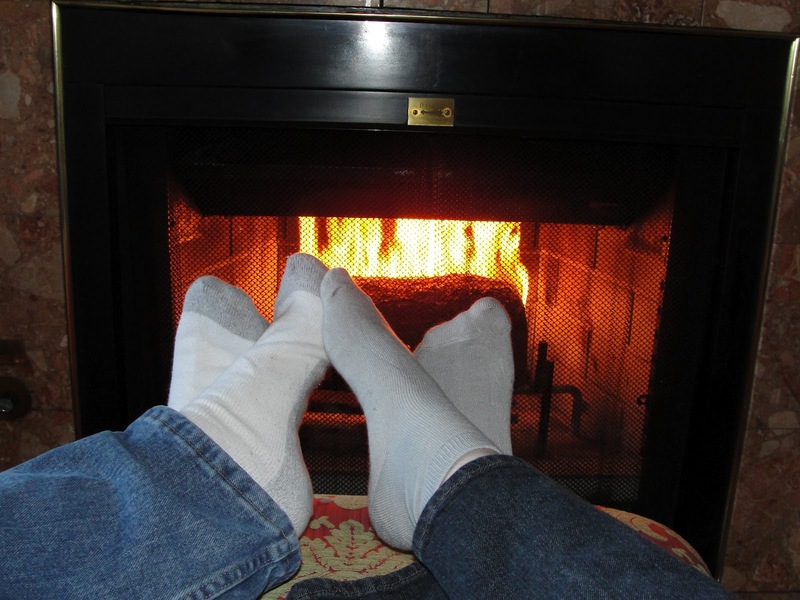 It's mine and my husband's feet in front of the fire on one of our favorite vacations. I need to figure out how to do the log and flames. I think I am going to leave out the fireplace, but I may put in something for the ottoman. It's all something I will have to figure out in the next month or two. I cant decide if I will put this on my May goals or not. It may have to be a June goal to finish up. I don't know how much time I will have in May for this project. I have a couple of big ones planned. This picture brings up memories of warmth, fun, love, fresh ocean air, comfy down beds, love and laughter. It just makes me smile. I cant wait to finish this hoop and hang it up. It's from a winter get away we had in Monterey CA. We stayed in a wonderful inn right on Cannery Row. Our room looked out over the Monterey Bay and we could see the sea otters while we had breakfast in the window seat each morning. We spent a couple of days wandering around the aquarium, a day on the beach behind the inn, and just relaxing in our room by the fire. I hope stitching this will keep it in my memory even after I am old and senile. I know it's not May yet, but I am going to go ahead and put up my May Goals now. I think that's all I am going to set up for this month because I have a long week of work happening the week of Mother's Day. My family has 2 exhibits set up for the Maker Faire and that'll take up a whole weekend. My daughter is moving out so I'll need to set up our living room back into a living room. And last, but not least, an old friend is coming into town for a weekend and we are planning a family dinner and maybe a bbq at the beach. Wow...that's a pretty packed month for us! I may have planned too many goals!